If you are looking for a hike that takes in views of the Gallatin Valley with a boulder field full of bouquets of flowers this is your hike. The west-facing slope can warm up early and you might find sagebrush buttercup (Ranunculus glaberrimus) and biscuitroot (aka Cous) (Lomatium cous) as early as March. We love the flowers in the meadow and within about two miles from the trailhead and often use this as a “warm-up” hike in March and April as soon as the snow is out. This is a gently climbing single-track that weaves through the meadow and then along the creek. We would consider it easy, just watch your feet, as you will be stepping over the rounded boulders that are in the meadow. It is well worth the 15 mile drive from Bozeman. As you drive up Springhill Road on your way to the trailhead you will be greeted by arrowleaf balsamroot (Balsamorhiza sagittata) and lupine (Lupinus spp. ), on both sides of the road. From I–90 and the North 7th Avenue overpass, drive 2 miles north on 7th Avenue (West Frontage Road) to Springhill Road. Turn right at the light and drive 14.6 miles to the trailhead pullout on the right. Springhill Road becomes Rocky Mountain Road at 11.3 miles when the pavement ends. The trail starts on the left of the parking lot near the sign. The trail generally follows the fenceline on a well-worn path up the hill. From the moment you park, yellow, purple, and blue will fill your sight from the end of May through the end of June. Later in the summer you can look for thin-leaved owl clover (Orthocarpus tenuifolius) and sticky geranium (Geranium viscosissimum). In just a few feet from the parking lot you can find over ten species of wildflowers. The showiest are the arrowleaf balsamroot and lupine, but as you look more closely you will see low larkspur (Delphinium bicolor), small-flowered woodland star (Lithophragma parviflorum), and biscuitroot. Expect to find these flowers as early as mid-May depending on the year. In the first ¾ mile of the trail that traverses Half Circle ranch you might find your fill of flowers and decide to turn around at the first gate. At 0.7 miles you will either rock hop or wade North Cottonwood Creek. Pasqueflowers (Anemone nuttalliana) and Parry’s Townsendia (Townsendia parryi) will reward your short walk up hill toward the creek and in the meadow just through the first fence. The trail access is a ranch privilege, not an easement. Stay on the trail and help keep the access open. If you decide to make your way through the fence at ¾ miles from the trailhead and into the Forest Service land you will find bluebells (Mertensia spp. ), ballhead waterleaf (Hydrophyllum capitatum) and Woods forget-me-nots (Myosotis sylvatica) in the more shaded areas along the creek. Take some time to have a snack and rest beside the water before continuing into Forest Service land. You continue by the creek and a series of cascades, pools, and small waterfalls on your way to Hardscrabble and Sacajawea Peaks. At 1½ to 2½ miles the trail is harder to follow (trails on either side of the creek). Generally follow the north side of the creek; however all visible trails lead to the same area. At three miles, Hardscrabble peak comes into view. The North Cottonwood Trail meets the Foothills National Recreation Trail at about 8,900 feet. It is eight miles from the trailhead to Fairy Lake. This is Hike #2 in the “Day Hikes around Bozeman” and more information is available in Robert Stone’s book. This trail requires a lot of “rock-hopping” through the boulder strewn field as the trail ascends to the woods and up the mountain. For a short hike, there are plenty of flowers in the field from the road to the trees and the trail is only slightly ascending. Aside from the cattle that graze during some parts of the year, this trail has been virtually untouched by plows. Vignettes of flowers are spread throughout the field. The creek crossings are easy through most of the summer; watch for high water during run-off season (April – late May). The trail becomes more uphill once you enter the woods. Dogs are allowed off leash; however if there are cattle present, be sure to control your pet. Close all fences and stay on the trail. Photos on this page (Top to Bottom): low larkspur, sagebrush buttercup, arrowleaf balsamroot, small-flowered woodland star, Parry's townsendia Click to Enlarge. 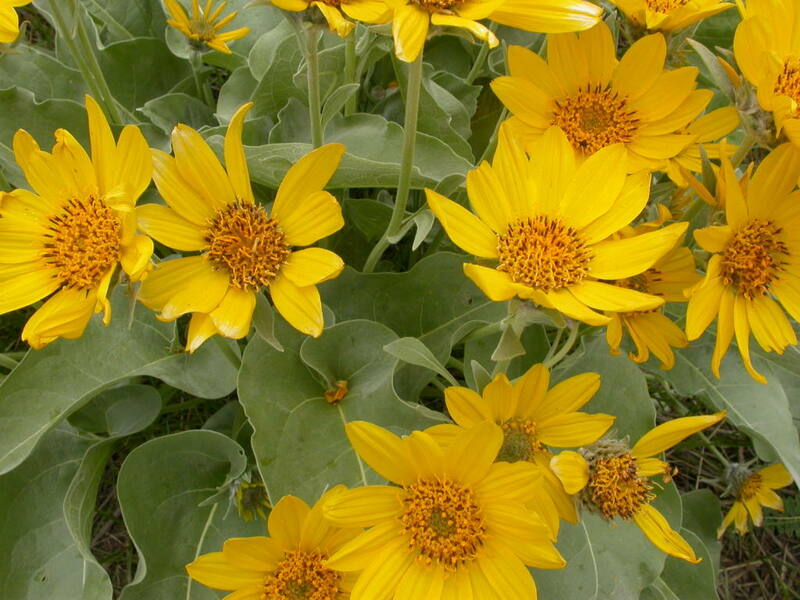 Arrowleaf balsamroot flowers are stunning across the entire meadow. Lupine and sulfur (yellow) paintbrush are also easily found. The creek crossing was impossible today as the creek raged across the trail. Other flowers in bloom included: Hood phlox, prairiesmoke, common yarrow, field chickweed, low larkspur, nine-leaved parsley, lemonweed (Western gromwell), groundsel, small-flowered woodland star, short-styled onion (red), forget-me-nots, Parry’s townsendia, many-flowered stickseed.